Let's face it--the best gift a girl can receive is one that makes her feel pampered, especially since life can be so stressful these days. Help your favorite female de-stress with these luxurious products from Pevonia Botanica. Start with the Anti-Stress Bath & Shower Gel, made up of hazel nut oil, chamomile and lavender to cleanse and hydrate. Apply all over your body during a bath or shower and feel the stress melt away. The Anti-Stress Bath Salts with Essential Oils also work wonders; just pour one or two scoops of salt into a warm bath and experience its calming properties. Need more relief? Try the Anti-Stress Aromatic Seaweed Bath, designed to mineralize and nourish. With seaweed and pine needle essential oils, it detoxifies and renews. Finish with the Dry Oil Body Moisturizer with squalane, chamomile and lavender to leave skin silky soft with a radiant glow. Once she's hooked, treat her to Pevonia's De-Aging collection including mists, saltmousse and body balms in papaya-pineapple and passion fruit. She can try them at home or at a Pevonia spa--go to www.pevonia.com to find the one nearest you. Judging from my own personal experience, most men are hard to shop for. But give them something they could really use but won't go out and buy themselves--and you just may score points this Valentine's Day. Leave it to Lush, the fresh handmade cosmetics company, to come up with a solution. 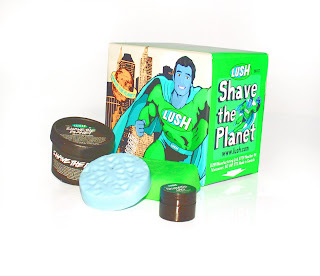 The company's Shave the Planet Gift set ($29.95) features three essentials he can use to look and feel his best. Sold in a special gift box that's wrapped up in a comic strip, it's designed for the superhero you know and love. Inside, he'll find Shave the Planet Shaving Cream (designed for super-smooth shaves), Cosmetic Lad Moisturizer (to soothe sensitive faces), Bamboo Soap (to tone and leave skin smelling like the rainforest) and a Business Time Massage Bar (for all the relaxation he needs). The trick now is getting him to use all of these little luxuries! At least I know the shaving cream won't go to waste! For more info or to make a purchase, click on www.lushusa.com. I've always been up for trying out new eyeliners, lip glosses and skincare products but foundations are another story. I guess there's just something about covering my pores with makeup that always made me a bit uneasy--until I discovered Barry Knapp, developer of the new Oxygenating Breathable Foundation. His passion? Studying the science of oxegeniology and its ability to heal and affect each individual genetically. After working with plastic surgeons on products that would provide coverage and help heal, minimize and eliminate procedural scars, Knapp created the air-permeable foundation. The secret ingredient: Ceravitae Complex, a patent-pending formula proven to increase oxygen uptake, stimulate skin cell production and speed the healing process. And the fact that it's water-resistant for up to 90 minutes, contains SPF 25 and comes in seven blendable, color-corrective shades makes it just as appealing to those of us who haven't undergone procedures as well. Definitely worth a try, right? I smooth some on and watch it effortlessly disappear into my skin. As the official makeup director of the 2009 Sundance Film Festival, Knapp recommends three ways to use it. "Apply it with your fingers to get into all the little grooves, use a sponge if you want to detail it out or try a washable, acrylic brush." He suggests applying in downward strokes, keeping in the direction of hair growth, and insists on continuing past the jawline, covering the face and neck. The best part: It won't come off until you take it off! For more info, check out www.oxygenetix.com.